Why did Walmart raise its wages? This article is reproduced with permission from Forbes. Find the original story here. Walmart recently announced that it was raising its minimum starting wage to $9 an hour, 24% higher than the federal minimum. Since Walmart is famous for its ruthless cost management, this appeared, on its face, to be a significant sign of a tightening labor market. We prefer to look at the data. 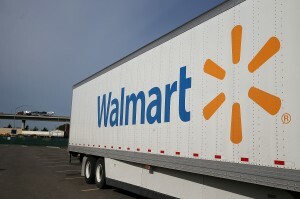 First, we must beware the smoke and mirrors: Walmart is obviously looking to extract the maximum political benefit from its announcement at minimum cost. The company says that its wage increases will impact 500,000 workers, but the number who will see their wages rise from the federal minimum of $7.25 to $9 is much smaller. Only 5,000 of its 1.4 million workers actually make the minimum wage. And the minimum in most of the country, 29 states, is already considerably higher than the federal minimum. Seven states and the District of Columbia have minimums of $9 or higher. So the average pay raise for the affected Walmart workers will be far less than the 24% raise for the very small number currently earning the federal minimum. 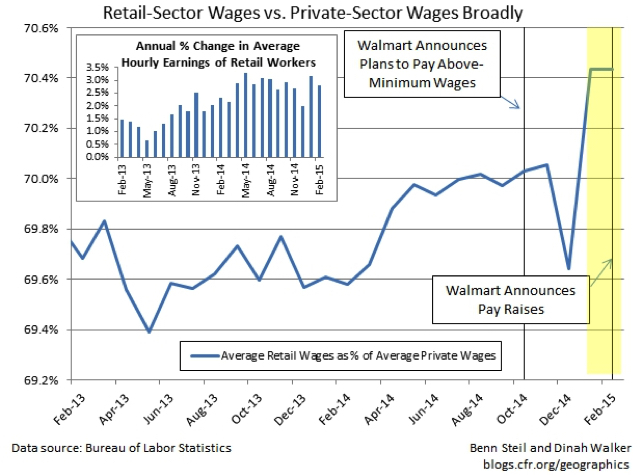 Second, Walmart’s average hourly wage is considerably lower than that in the retail sector as a whole: $11.81, compared with $14.65 broadly. It cannot, therefore, ignore competitive pressures in the wider retail sector labor market. Which brings us to the third and most important point. Retail sector wages have risen robustly over the past year – 2.8%, far higher than the 1.6% in the private sector as a whole. The strength of the sector’s labor market is illustrated in the figure below. The retail sector quits rate, the number of people quitting jobs as a percent of total employment, is also considerably higher than the quits rate in the private sector broadly: 2.9% versus 2.2%. Not surprisingly, Gap and Ikea have made wage-hike announcements similar to Walmart’s. Retailers are clearly having more and more trouble finding and keeping workers at the federal minimum wage. In short, Krugman’s story of Walmart raising wages in response to political pressure simply flies in the face of the evidence. Walmart is just being Walmart: making a rational decision to lure and retain workers in a tightening retail labor market through greater compensation. The problem with ignoring this evidence is that it encourages the notion that we can make wages, in Krugman’s words, “a political choice,” with no concern for its effect on employment.